The Power Save 1200 and Energy Saving Kit can save you 35% or more on your power bills. You will see immediate savings as soon as the kit is installed. A Power Save Energy Savings Kit will help your home to be more energy efficient. The Powersave 1200 unit will eliminate wasted electrical consumption while the Radiant Barrier and Solar Attic Fan will keep your home cooler in the summer and warmer in the winter. Using this kit in your home will help considerably in lowering your energy consumption, then if you decide to go solar then you will be able to install a much smaller and less expensive solar array! Of course you can buy these seperatly or together in the Energy Savings Kit. In fact those that have installed the Powersave 1200 ONLY, have seen decreases in their power bills from 15%-25%. The power save 1200 is a small box that fits neatly next to your breaker panel. It will give you significant savings on you power bills, save electricity, and extend the life of all of your appliances while providing surge protection for your entire home. This unit reduces wasted electricity and recycles electrical energy in your home. The power save 1200 increases the power factor by reducing the amount of power that an appliance (washer, dryer, computer, refrigerator etc…) draws from the electric company. 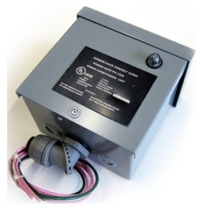 When any electrical devise is turned on it draws power (voltage and amperage) from the transformer to run. This power demand runs through the wiring, to the panel box, into the meter and down the lines to the transformer. This power demand (watts) heats up and puts a strain on the motors and wiring. When the power save 1200 unit is installed and turned on, it stores the power and only releases the precise amount needed to run the motor for each appliance. This reduces the amount of heat in the wiring and motors. The bottom line is that you will save electricity see a definite difference in the savings on your electric bill. With the installation of the Power-Save 1200 ONLY, many customers are realizing savings of up to 35% on their electric bills. Add in the extra power saving features of the Energy Saving Kit and you will save even more. Save up to 35% on your power bill! Increases the life of your appliances! Pays for itself in less than a year! Reduce the chance of fire! Install in 30 minutes or less! Also, if you decide to move you can take the unit with you. If you would like more information on how to save electricity in your commercial application, then see the information below on the Power-Save 3200 and 3400 units. For more information on how all of these units work and will save electricity, take a look at the demo movie and see the Testimonials and Frequently Asked Questions below. To save considerable cooling costs in the summer you must get rid of the trapped hot air in your attic that makes your entire home hotter., This causes your air conditioner to work harder creating unnecessary wear and tear and costing you much more money in utility costs. 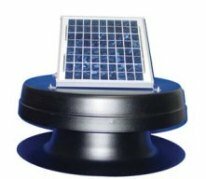 This solar attic fan will get rid of that hot air so your entire home stays cooler so you will save electricity and money on your power bills. Plus, there is no charge to operate the fan since it runs on the suns energy which is collected from the solar panel on the top of the fan and is stored as energy to run the fan. The Radiant Barriers are typically installed in the homes attics to reduce the amount of heat in the attic in the summer and to save on heat loss in the winter. They are made of an extremely reflective material that will reflect the radiant heat instead of absorbing it. Heat travels from a warm area to a cool area by a combination of conduction, convection, and radiation. Heat flows by conduction from a hotter material to a colder material when the two materials touch. Heat transfer by convection occurs when a liquid or gas is heated and rises. Radiant heat travels in a straight line away from the hot surface and heats anything solid as the wave of energy hits it. When the sun heats a roof, it's primarily the sun's radiant energy that makes the roof hot. A large portion of this heat travels by conduction through the roofing materials to the inside of the attic. The hot roof material then radiates its gained heat energy into the cooler attic (some of the roof's heat will radiate in other directions too). A radiant barrier reduces the radiant heat coming in from the roof to the attic. 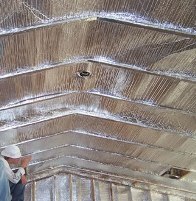 The material is fiberglass re-inforced aluminum foil insulation that is fire retardent and reflects 95% of radiant heat. It is also perforated to eliminate sweating. This material is easy stapled on ceiling joists, or rafters and is sealed with the aluminum seal tape. This material is very durable and reisistant to water, oxidation and weathering. You can use it for attics, walls or inside roofs. Leaky ducts can reduce your homes heating and cooling efficiency by as much as 20%. Insulating and sealing your ducts with the Radiant Barrier and duct seal tape can save you a tremendous amount of wasted energy. It increase you homes efficiency and lower your power bills. 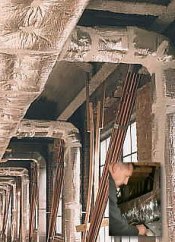 Also if you have plans for a new heating and cooling system, well sealed duct work may allow you to downsize to a smaller less costly system. One (1) Solar Attic Fan and One (1) Powersave 1200 Unit is included with each square footage application below. See below for the number of Radiant Barrier Rolls and Tape Rolls Required for your square footage. Note: For larger homes custom quotes will combine a larger 20 Watt Solar Attic Fan and the required Radiant Barrier Roll/Tape Combination. Please call us at 336-802-1954 for a custom quote or fill out the Contact Us Form at the bottom of the page, with your homes square footage and whether it is a one or two story home. With all of the same benefits of as the Powersave 1200 for the home, the PowerSave 3200 and 3400 are designed to save up to 25% on your electric bills in the larger commercial and business buildings. To determine which unit, the 3200 or 3400 is right for you, see the information below. To See A News Clip On How A Maryland School Plans To Save With The PowerSave 3400 CLICK HERE! To See A Demo Movie Of How The PowerSave Unit Works CLICK HERE!